This weekend in L.A. (February 16-18) includes the Chocolate & Art Show, NBA All-Star events, the Golden Dragon Parade, a Boozy Bake Off, and MUCH more. 1. Palm Springs Modernism Week returns February 15-25 to celebrate all things midcentury modern including architecture, art, interior landscape design and vintage culture. 2. The Chocolate & Art Show Los Angeles returns to The Vortex in DTLA on February 16-17, with chocolate fondue, the work of up-and-coming artists & more. 3. The NBA All-star extravaganza is back for another year of fan celebrations, celebrity games and all things basketball. Beginning on February 16, then continuing till February 18, Los Angeles venues including Staples Center and Verizon Up Arena at Los Angeles Convention Center will host a variety of All-Star events, including showcases, games and trainings. 4. Jack Daniel’s has been selling its whiskey since 1866 and this weekend they will bring a pop-up shop to Los Angeles for just three days. From February 16-18, the Jack Daniel’s Lynchburg General Store will offer Angelenos a unique assortment of goods, services and events featuring live music and Southern food from Miss Mary Bobo’s, a Lynchburg institution for over a century. 6. Celebrate the Year of The Dog during a Lunar New Year Celebration at Hsi Lai Temple in Hacienda Heights. 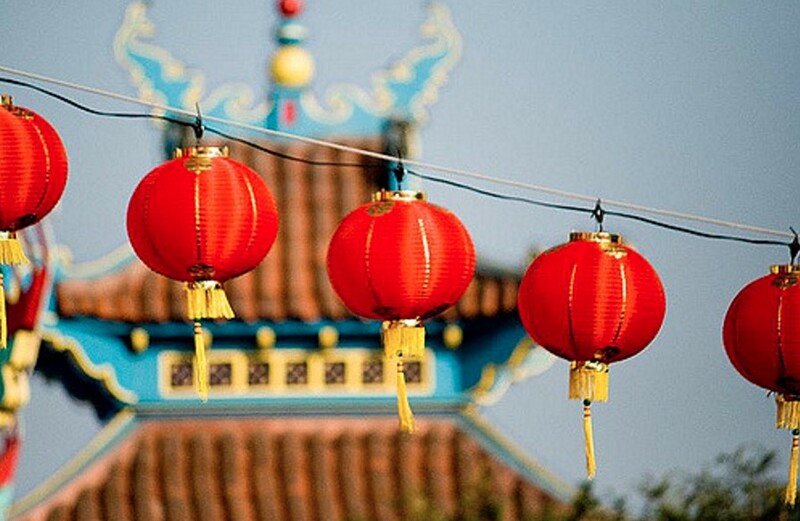 The temple will host Chinese traditional cultural performances and the grounds will be decorated with dog decorations. Happening all weekend. 7. Bootie LA presents a 90’s vs 80’s mashup night at the Echoplex this Friday. 9. The Pan African Film Festival (PAFF) continues through February 8-19. Now in its 26th year, the 12-day festival will showcase over 100 new films and the talented artists who created them. 11. Celebrate the Year of the Dog during Lunar New Year at Santa Monica Place. Enjoy Asian-themed stilt walkers, traditional Korean fan dancers, Chinese music, The Voice’s Katherine Ho as emcee and more. 15. The 40z & Waffles Brunch Series is back for NBA All-Star Weekend. Not your ordinary Sunday Funday, attendees will enjoy brunch, cocktails, a surprise live performance and more at Viva Hollywood. Early-bird tickets are currently $40. 20. There’s a midnight showing of indie flick Once Upon A Superhero at the Hollywood Playhouse theatre. The screening will also have various live entertainment, music, comedy, a 420 market and food vendors. 21. Comedy show that’s BYOB and dog friendley? Yup On Deck Comedy is just that and they’ll be performing at the Nerdist Showroom this Saturday. 23. See My Neighbor Totoro in 35mm at the Aero Theatre this Saturday. 24. The Great Boozy Bake Off will take place at Angel City Brewery in DTLA this Sunday. The bake off will feature bakers testing their skill at incorporating booze into cupcakes, candies, breads and more. A $2o ticket gets you a sampling of all the contestants creations and all proceeds will be donated to the Leukemia and Lymphoma Society. There will also be games, a cookie-decorating station and more to be announced. Beer is not included in the ticket price. 26. The New Bad Boys of Magic have got some dirty tricks up their sleeves at Hollywood’s Three Clubs Cocktail Lounge this Sunday. These boys are fresh off of their sold-out run at the Hollywood Fringe Festival so expect some magic you’ve never seen before. 27. The Minor Threat art exhibit pays homage to the 80’s straight edge band of the same name with more than a dozen artists and vendors showcasing mixed media work, plus live music. Taking place this Sunday from 1 to 6 p.m. at 5 Star Bar in Downtown. Tickets are $20 at the door. You can read more background here via LA Taco. 28. L.A. Stories combines writers and musicians to create a story inspired by living in Los Angeles. This music and storytelling show will have performances about the L.A. droughts, celebrities, dating in L.A. moving to L.A. and more. NOTE: If you’re looking for ideas for what to do on President’s Day, Monday, February 19, go here.